Crown Paints have launched their spring/summer 2019 paint colour range, providing us with a telling insight into paint colour trends for the year ahead, and plenty of inspiration for anyone considering a new colour scheme for their rooms. And while we love, love, love the new range, we did take the chance to ask Crown at their launch what percentage of their paint sales were made up by colours. The answer? An astounding figure (although admittedly an on-the-spot estimate) of just 10 per cent, with whites and creams still dominating sales. You'd never guess from looking at Instagram, right? Whatever – we still love experimenting with colour in our homes and we know that many of you do, too (if our growing Instagram community is anything to go by). So, whether you're planning a complete decorating overhaul, or simply fancy experimenting with new, on trend shades to freshen up a tired looking space, one of Crown's three colour palettes – Redefined, Movement and Immersed – is likely to appeal. Indulge yourself in a thorough browsing below. Forward-looking, the Redefined collection celebrates mass production and the ability to create something new from something old. A contemporary clash of chalky pinks and cement greys, Crown Colour Consultant Judy Smith loves the idea of 'using soft pastels with a graphic grid to create a look that's fresh and new'. Inspired by the presence of bright lights in a concrete jungle; global travel and street culture the Movement collection combined burnished greys with bold stamps of colour. Justyna Korczynska from the Crown Design Studio suggests using these shades to create 'strong geometric shapes'. Immersed is intended to create an atmosphere of self-awareness, taking inspiration from one of the basic elements of life: water. 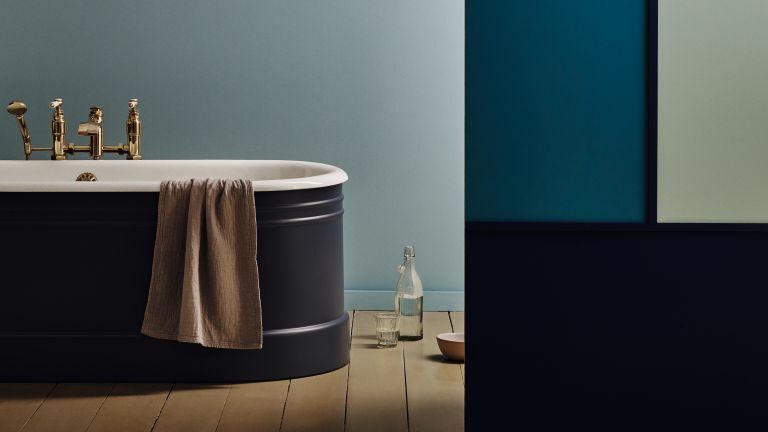 Crown Colour Consultant Neville Knott notes how this colour palette 'blurs the structures of any space bringing light and tranquility,' as well as his 'love of the use of aqua that gives a slightly retro '50s mood'.